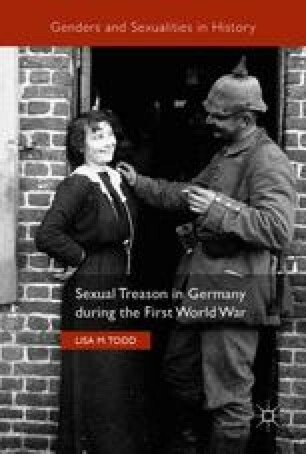 This chapter investigates scandals around romantic relationships between German women and foreign prisoners of war (POWs). From the arrival of the first POW trains to court cases of adulterous war wives, unfaithful German women were accused of betraying not only their husbands, but the entire wartime nation. Indeed, even flirting and letter-writing were evidence of ‘sexual treason’. Germans sought to explain female immorality in several ways: they equated sexual desire with ‘degeneracy’, vividly described the ‘exoticism’ of foreign men, decried the secularization of society, and asked hard questions of political authority. Female adultery became an enduring memory in post-war national consciousness. Some commentators placed promiscuous women in the category of ‘inner enemies’ who had stabbed the German nation in the back.